Come on, 'fess up: What's the...oddest thing you collect? When many of us started collecting comics, it was likely looked at askance. But these days...it's a thing that some people do, even though we're no longer pretending it's an investment. These days, maybe you need that argument for your dolls, I mean, action figures. But what is the daftest thing you buy too much of because you just like having a lot of them, or a wide range around? Here's my full disclosure, of what I can't justify: I pick my Band Aids based on mood, usually whimsy. In fact, I'm about to go internet shopping for more sticky plasters—to fill up on what I'm running out of (I go through Batman like nobody's business, and to see what out there I don't have. 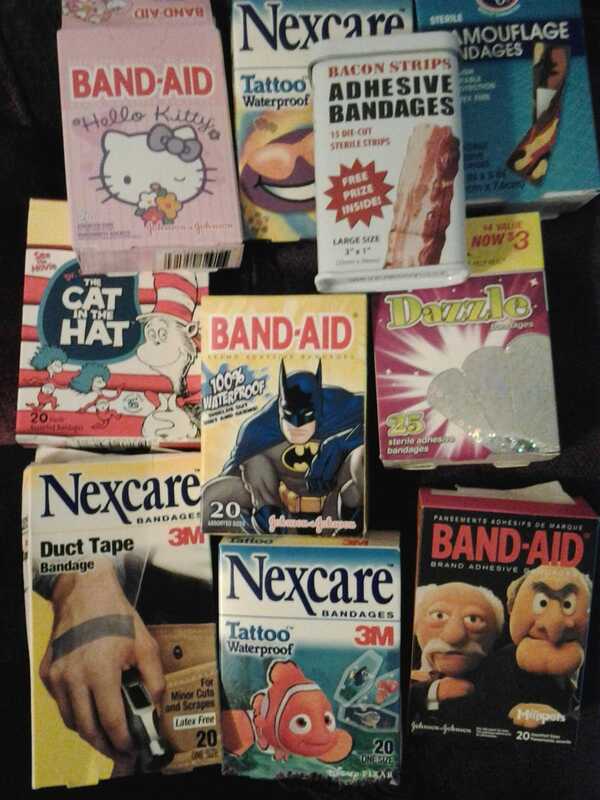 I toss bandaids into notes I'm sending people, and people will send me on point bandages—the bacon ones in that picture are a gift, and a gift I love. So, no, that makes no sense. Anything you have that doesn't pass cool kid muster?